We can all use a little more spice in our lives, right? Add a little bit of adventure into your routine with this juice that is going to have you thinking warm thoughts and envisioning late autumn hay rides where your wrapped up in your coziest sweater and nuzzling into someone that you love. It's hard to find a blend that can really accurately recreate this flavor and we can assure you that this is so close to the real thing that you are going to be shook in every sense of the word. When you get a hold of this blend it is going to be like you have found that juice that you have been after for your entire vaping career. When you start to vape it you are going to feel the way that it is able to make you feel comforted, satisfied and like you are able to really get that enjoyable vaping experience that lends itself to giving you the kind of sessions that have you walking away from them with a big smile spread across your face. 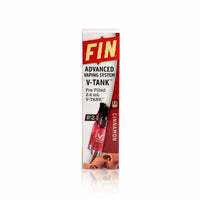 The team over at Fin does their best to be able to make products and solutions that are going to make your routine seem so much easier than usual with them in your life. They really have a knack for coming up with innovative devices that bring so much convenience and functionality into play. Cinnamon is your slightly spicy, warm kind of flavor that is going to have you thinking about those chilly mornings and stomping on leaves.